Stew Beef is generally taken from parts of a cow’s carcass that are deemed suitable for slow, moist cooking. The ideal cuts for stewing are well-marbled and contain a large number of connective tissues. Stew Beef is not only suitable for stewing but can also be used to make braised meat, broths and beef soup. When stewed, it is typically cooked with vegetables like celery, carrot, potatoes and onions, with water, beef stock or wine serving as the cooking liquid. To add some flavor to the meat, it should first be coated with some seasoned flour and then fried to lock in the meat juices and preserve its flavor. Simmering on low heat is preferable since boiling can harden the meat. In most cases, Beef for stew is taken from the Chuck or the Round but it can be taken from any part of the animal with the exception of Top Round and Shank. 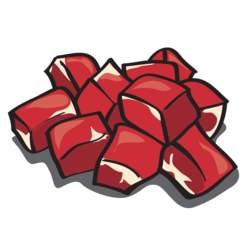 Stew Beef is the name given to packaged meat that retailers sell separately for stewing. While packaged Stew Beef is precut and is, therefore, higher in price, people can create their own cheaper Stew Beef cuts by purchasing the roast parts of tough Beef cuts and carving them at home.